This mining license spread over 40 square kilometers area is in the province of Chami, which are about 350 km. from the capital city of Nouakchott and 150 km from the port city of Nouadhibou. 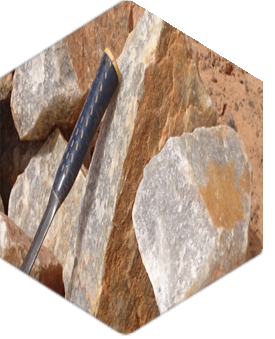 Geological mapping and extensive trenching (more than 20 km) led to a mineable proven (measured) reserve of over 725,000 million tons of quartz mineral considering top 2.7-meter depth in the licensed area. Pits (up to 20 m depth) have been opened at 33 locations in the licensed area. Quartz veins of varying dimension have been observed up to a maximum thickness of 8 m and height of 10 m. These vein runs in to more than kilometer distances. The deposit is by and large in the form of white milky to glassy crystalline boulders and at certain points smoky / colored quartz. The boulder size varies to a large extent starting from lower than 500 mm to more than 3000 mm. i. High purity quartz (> 99.8 % silica) finds application in making EMC-filler (semi conductors), telecommunication, high temperature lamp tubing, solar panel, fiber optics, crucibles, etc. ii. High quality quartz (> 99 % silica and white in color) finds application in making raw material for engineered stone. iii. Standard quartz (< 99 % silica) finds application in making glass and ceramic industries, Ferro silicon, etc. 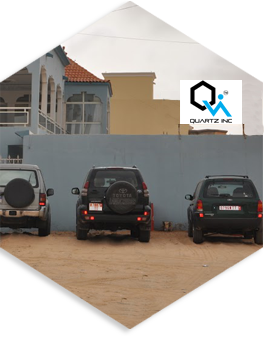 Some of the high quality quartz samples from promising pits were sent to DORFNER / ANZAPLAN in Germany for evaluation in terms of quality and process ability. They confirmed highest purification to IOTA 4 standards and describe the deposit as one of the top five deposits in the world. The African plate is composed of five cratonic masses including the Kalahari, Congo, Tanzania, Saharan and West African Craton. The last two form a major part of present day Precambrian basement of Western Africa. 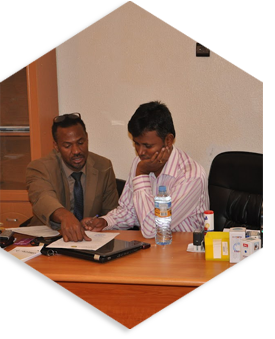 Geology of Mauritania can be identified with 5 main geological provinces, which include the Reguibat Shield, the Taoudeni Basin, the Tindouf Basin, the Mauritanides Chain and the Atlantic Coast Sedimentary Basin, being listed in the increasing order of geological age. The Reguibat Shield, which covers a significant part of the North of Mauritania, is composed of the Archean and Lower Proterozoic metamorphic rocks and granites. The Archean metamorphic comprises of lithounits in ferruginous quartzites, mica schist, gneisses and amphibolites. The Taoudeni Basin lies in the southeast of Reguibat Shield and is the largest Proterozoic basin of WAC, the litho-units comprising the Upper Proterozoic sequence of sandstone, mudstone and limestone, the Cambrian to Ordovician sequence of conglomerates, mudstone & sandstone and Silurian to Carboniferous sequence of sandstone. The eastern part of this basin is covered with Mesozoic to Cenozoic sediments. The Tindouf Basin represents a small portion in the northeast extent of Mauritania. The basin consists of dolomite of the Upper Proterozoic and sandstone, shale and limestone of the Ordovician to Devonian age. The Mauritanides Chain is located in the Western Margin of Taoudeni Basin and represents the greenstone belt comprising of thrust metamorphosed sequence constituting sedimentary, igneous and metamorphic rocks of the Precambrian to Paleozoic era. The formations can be identified in three zones. Moving from West to East, the first to strike is the Precambrian sedimentary sequence called the external zone. The Atlantic Coast Sedimentary Basin is the Western most geological provinces in Mauritania and covers the entire Atlantic coast of the nation. The formations are mainly the calcareous-argillaceous-marly sandstone range from Lower Cretaceous to Quaternary, wherein the older formations are exposed towards Eastern end abutting to Mauritanides Chain. 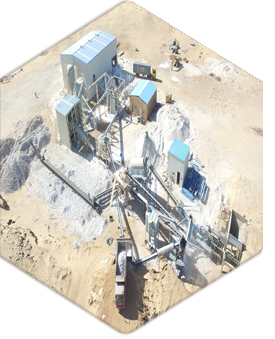 A state of art crushing plant involving primary (600 x 900 mm) and secondary (400 x 600) jaw crushers, 4-deck vibrating screen and tramp magnets with quartz lump production capacity of 100 tph has been commissioned in 40 sq km quartz mine at Chami, Mauritania. 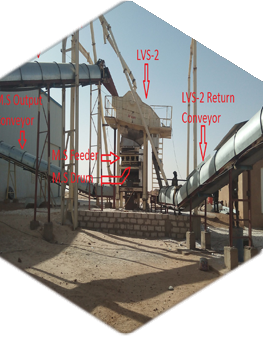 Lump production facility also includes manual sorting of quartz lumps over 1200 mm flat conveyor belt (35 m long). 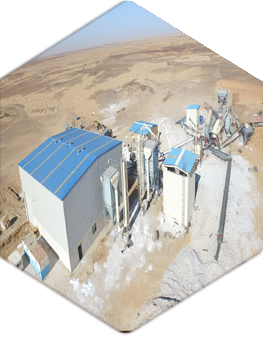 An extension of quartz lump production facility has been also commissioned in the form of tertiary vertical shaft impact (VSI) crusher to produce -4.76 mm size quartz grits at 20 tph to meet the requirement of engineered stone industry. 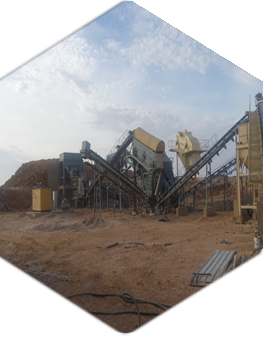 The tertiary crushing section involves magnetic drum & roll separators, linear & gyro screens and six product storage hoppers other than the VSI. 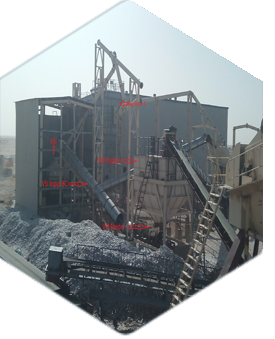 All the crushing equipment, product delivery and discharge chutes, conveyor belts are connected through ducting line for suction of dust. A total of three bag filters have been installed to operate under dust free environment. 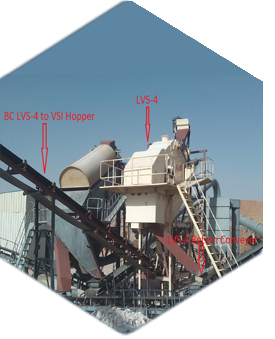 Feed for VSI is manually sorted and output from VSI passes through drum magnetic separator to ensure quality of the end product. An industrial shed was constructed over 750 sq meter area to house one three deck linear screen, two high intensity (12,000 G on belt surface) magnetic roll separators, three triple deck gyro screens, seven z-conveyor belts, six hoppers (60 T capacity each), series of grate and plate magnets, packaging machines and two fork lifters. Color sorting machine is being installed as an alternative to manual sorting of quartz. 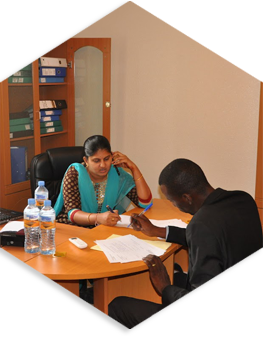 As a part of production quality control, a lab has been set up for particle size distribution analysis. Mined big boulders (greater than 2 ft in height and 3 ft in length and free from joints or cracks) are numbered based on their origin and chronology and their dimension, color, crystalinity, etc. are documented. Boulders are transported either near to portable quarry machine or to stationery wire dressing machine. They are dressed one or all the sides depending on the requirement of cutting on a block cutter and market demand. 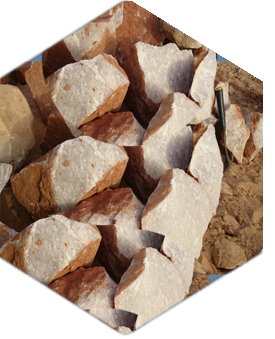 White or light smoky colored and crystalline or milky quartz boulders (lower than 2 ft in height and 3 ft in length) are subjected to rock breaking to produce size below 500 mm, the size suitable for primary jaw crusher. 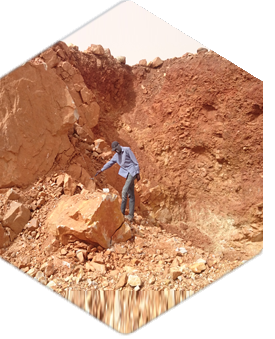 Post crushing sizes of 20 – 100 mm are manually sorted to get lumps completely free from monolayer of schist or laterite coating out side of quartz boulder. 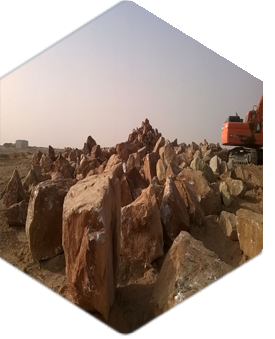 The sorted boulders are screened to produce various sizes as per market demand. 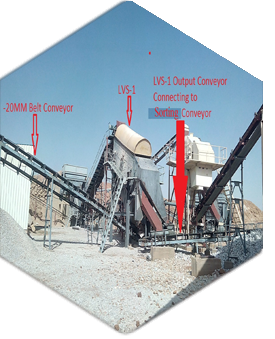 Manual or machine sorted lumps (lower than 20 mm) are fed to VSI for rock to rock crushing and subsequently screened to produce grits of various size as per market demand. 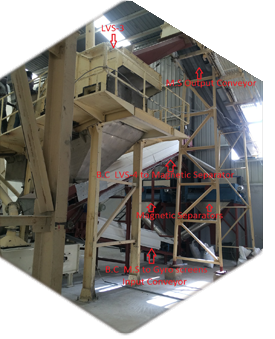 The produced grits passes through a series of magnetic equipment to generate product completely free from ferrous iron particles (physical process contaminant) and colored quartz particles. Dressed quartz block are cut in to slabs / tiles using multi blade cutter. Slab / tile cutting thickness is adjustable within a range of 12-30 mm. Total capacity is 5000 square feet per day. 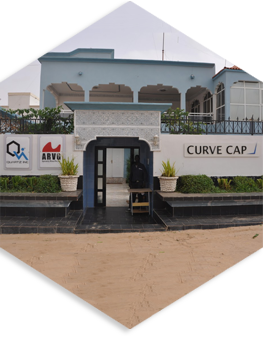 Cut slab / tile are subjected to auto polishing till glass smooth finish is obtained. Finished tile sizes of 1 x 1 or 1 x 2 or 2 x 2 feet are also made depending on the market demand. Likewise, half slabs of 2 x 3 or 2 x 4 feet sizes are made. Small size quartz tiles are arranged on table and joined together using clear epoxy resin. They are subjected to polishing post consolidation. Full size of slabs 9 x 5 feet are available in thickness of 15 – 30 mm. Other small sizes and thickness of mosaic slabs are also made depending on market demand. This machine has 3D stone through cutting facility and mainly used in making inlay artwork. This machine has also 3D stone cutting facility and mainly used for making quartz kitchen countertops.